Nalgene™ Chemical 14 Qt. Bucket - 13" H x 11-5/8" Dia. | U.S. Plastic Corp.
HomeThermo Scientific™ Nalgene™ Labware Thermo Scientific™ Nalgene™ Miscellaneous Labware Thermo Scientific™ Nalgene™ Polypropylene Chemical Bucket Nalgene™ Chemical 14 Qt. Bucket - 13" H x 11-5/8" Dia. Nalgene™ Chemical 14 Qt. Bucket - 13" H x 11-5/8" Dia. Extra heavy weight and rigid walls for heavy duty use. Polypropylene in natural white color. Nylon coated handle. Molded-in graduations in pint and liters. Replaces stainless steel at half the cost. Autoclavable at 120° C, 15 psig (1 bar) for 20 minutes. Nalgene™ Chemical 8 Qt. 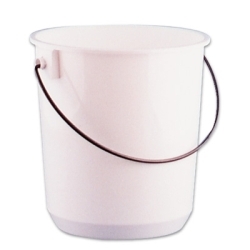 Bucket - 10" H x 8-1/2" Dia. Nalgene™ Chemical 11 Qt. Bucket - 9-1/2" H x 10-1/2" Dia.